Teen girls with manga, dealers room, Tentacle Grape, Vertical, and Yatta, Yatta, Yatterman! Yes, my readers, on the first day of Comic Con, I was graped. I didn’t want it at first. I kept on begging, “No! Please don’t! Stop!” But I eventually gave in and opened myself to the purple monster. Before I knew it, his tangy liquid filled my body. … and I kinda liked it. I even went back for seconds. Not a lot of industry stuff going on today. They’re saving that all for tomorrow. Check out Anime Almanac the Live on Saturday for all the crazy going on as it happens. urgh. up at 4 am west coast time, feeling the cold trying to overcome my embattled immune system. go away! Making myself a sandwich in order to save money on food at NYCC today. You won’t tempt me, expensive con food! Time to get a burning. Off to NYCC. Ack, time to go. Don’t wanna miss that train! Is Dark Horse having a manga panel? Work a few hours this morning, hitting NYCC about 1PM. Just in time for the Minimates panel. Bought insane amount of freshly baked croissants from rheon cafe in soho – it’s a specialty of this Japanese bakery. Crazy good stuff! No, not specifically manga. It’ll be like sdcc where they mix it up from various parts of their catalog. On the train into the city. If all goes well, I should be at the Javits by 1015 for Brigid Alverson’s manga panel. At the Javits Center nice and early. Eyes: bright. Tail: bushy. Ok…I’m ticked…train was late at us profesionals can’t go in till 10am…the retailers breakfast ends at 10!!! Damn you NYCC & LIRR!! See Shin chan and his boriqua honeys (hot latin ladies) at the FUNimation booth at NYCC. That’s booth 1607, papi. 5 for Friday. Be 1 of the first 5 people to answer the following trivia question correctly & win the S2 P1 Shin chan DVD that streets 2/10. Ready to play? And go! What is the name of Shin chan’s school? exclusive Soul Eater giveaway at the Yen Press panel tmw!! Mmm… @Deb Aoki brought sweets for breakfast. Exclusive Soul Eater giveaway at Yen Press panel tmw!! Are people dismissing manga as womens comics? kate doesnt think there enough manga for women. Where is the licensed akira for women? brigid just embraces the sparkle. If its junk its their junk. tricia if peeps want josei buy it. Support Nodame! just saw Calista First Second! Woo! I’m also counting the amount of times I hear the word “Twilight” today. Brigid just gave me number 7.
pubs should use the communities girls make with each other online. @Scott GAG, where it should be…non-existent. imho, to reach female adult mainstream readers, josei manga should be featured / reviewed in magazines like glamour or cosmopolitan. these female readers don’t read comics blogs, nor do they go into comics shops, so why are we surprised they don’t know about manga? The Shin-chan candle that @funimation was talking about. It’s @yenpress giving away free issues of Yen Plus mag. Tokyopop is in the house, but their booth is pretty small. Tokyopop’s announcement: a Domo-kun manga! Full-color. On sale Sept 09. FUNimation say no new announcements this weekend. Yen Press says yes! And my bit of fanboy showing, Scott Pilgrim!!!! CORRECTION: Yen panel is in Panel Rm 9 tmw! i knew i’d have some dispute with the selection promoted in the “otaku collection development” panel, but I stuck around anyway. This soda is not for kids! Tezuka, Tatsumi, Koike and Barefoot Gen — but oddly, a lot of titles that would be borderline for librarians. and no shojo / kids manga. 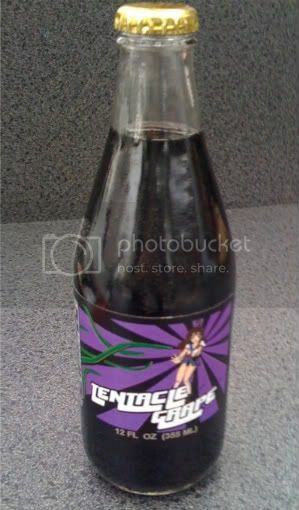 Tentacle Grape tastes pretty good! just spotted t-san a little while ago! is sho going to be here soon? Random girl selling anime merch on the street. Does she have a permit? This is not a bad sandwich for a hundred dollars! Ha ha, I kid, I kid. No mini mates panel. Boo. sho at delrey booth! no photos dammit! Where was the raffle line? Apparently no one knows. sho bowed to JY and me! yatterman is a no-go. tickets are already spoken for by all the fangirls. If you’re @ NYCC and have blue VIP sticker on your badge, u can get a free 15 minute massage @ transcontinental blue zone. Free water too, which is a small, but welcome perk when it’s $3.75 a bottle outside the blue zone. First panel of the day, x-men! Some dude askng why one of the x writers didn’t add him on xbox live. Next up: marvel dark reign! Guess 3G is back in the Javits? Splatterhouse panel is wrapping up. Just by seeing that presentation you know it’s going to be terrible. Vertical Publishing should be starting… now. First/last manga publisher of the day, what do you know? Vertical brings in the niche. On the line for Yatterman premiere. The fangirls are going nuts. At the Yatterman premiere with @JohnMartone @Hisui and @giapet. The only thing worse than going to the Javits Convention Center? Trying to walk far enough to get a cab to escape the Javits! Stuck at Penn Station waiting for the 8:51 train. I’ll probably be writing today’s blog posts while I wait. We are all sitting in the waaaay back. That’s press, baby. @Scott Gotta make room for the groupies, somehow. Because I didn’t get Yatterman tickets, where did I decide to go? Prototype? Nah. Graphic novels in academia? No way. MTV’s Badasses, baby. Yatterman… What can I say? The CG was bad and the slap shtick comedy was cheesy. But the corniness eventually won me over. There were a bunch of great LOL moments. Saw the wonder woman movie. Awesome! The line getting into the Yatterman showing. The guests welcome everyone. This is how far back we were. NYCC day 1 is over, and I have a five-hr date with my bed beginning now. Legs are DEAD from walking all day. Now for blog post, sleep, then tomorrow’s con day and more walking! On my way home. Tired but had a good first day! This entry was posted on Saturday, February 7th, 2009 at 1:46 am by Scott	.